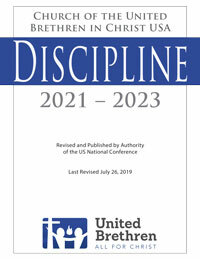 All organizational entities of the Church of the United Brethren in Christ, USA, are expected to follow and uphold the standards set forth in the Discipline. When individuals and organizational entities disagree with those standards, the proper recourse is to submit proposals for change to the US National Conference. Non-compliance with the standards agreed upon by the broader church is not a valid option. 1. Disseminating or tolerating the teaching of doctrines contrary to the doctrines of the Church of the United Brethren in Christ, USA, as stated in the Discipline. 3. Infringing on the rights of United Brethren members, as stated in the Discipline. 4. Insubordination or willful refusal to recognize church authority, whether at the local or national church level. 1. Local churches in the national conference. 2. Pastors and licensed ministers in the US National Conference. 3. The Executive Leadership Team. 1. Situations of a corporate nature which require discipline must be handled on an individual basis. The principles of conflict resolution outlined in Chapter 22 should be followed as much as applicable. The persons involved in dealing with the situations will vary, depending on the level–local or national–and the specific bodies or persons involved. Therefore, it is impractical to outline specific procedures intended to address all possible situations. Rather, the relevant governing body shall have discretion in how it proceeds. a. Private rebuke of the group in question, or its leader(s), by a national leader. b. Rebuke of the group in question, or its leader(s), before two or three witnesses. c. Rebuke before the appropriate governing body. d. Removal of group members from their positions. e. Disbanding of the group.